The busy season has arrived! I know it’s been far too long since my last post, but in my defense fall is the busiest time of the year around here. Even busier than spring, since it’s much harder to yank things out of the ground than it is to put them there in the first place. 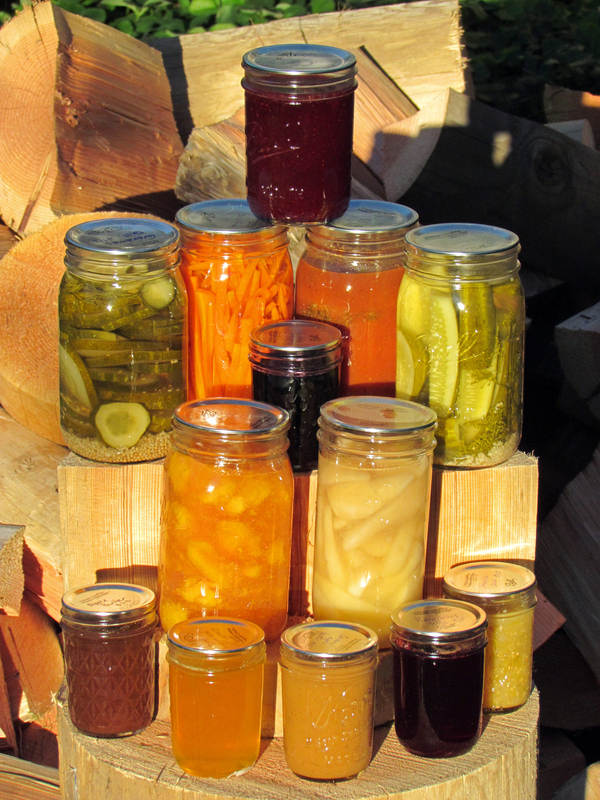 We are almost done with canning for the season, although the weather really messed up our blackberry harvest. Blackberries have to be picked before the first hard rain, since once they get wet they mold practically overnight. 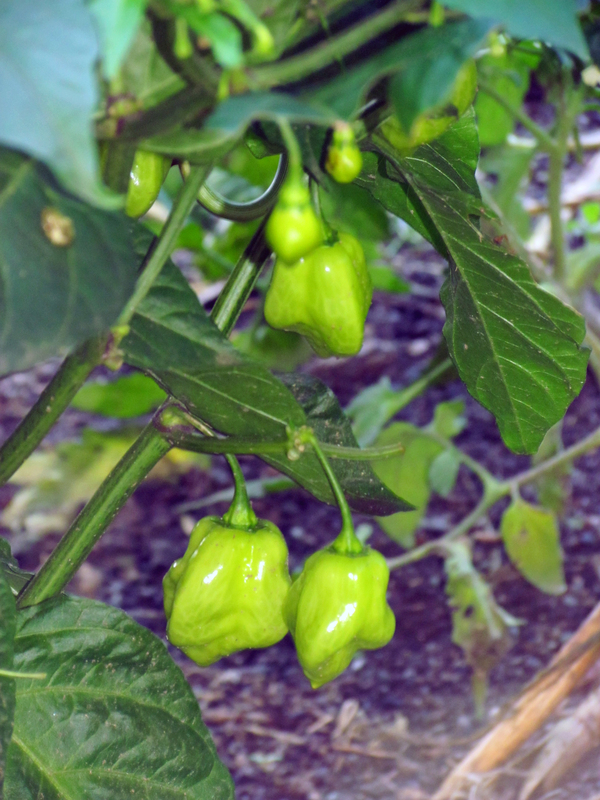 The rains came about a month early this year, so only about half of what we expected to pick got a chance to ripen. Stupid weather. For the first time ever we are canning lard! We saved it from when the three pigs were butchered, and about fifty pounds of pure porky deliciousness has been chilling in the freezer since then. The first batch is rendering down as I write this. Thank goodness Gene had the foresight to insist upon buying the meat grinder attachment for our Kitchen Aid mixer, because chopping all that by hand would have sucked. 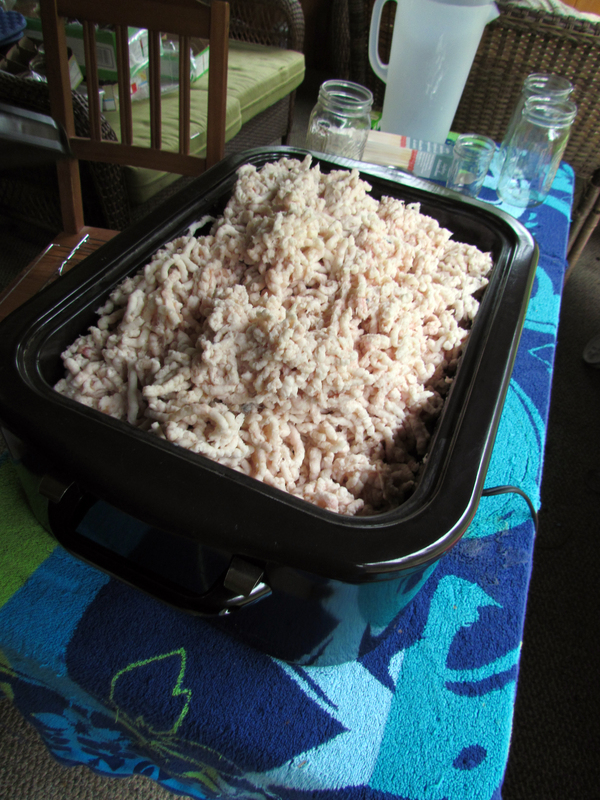 After grinding down a third of it, Gene put it in our portable roasting oven and carried it the back porch. I guess some people render it down inside, but we didn’t want our house to smell like the inside of a Frito Lay factory for 12 hours. Once it’s all cooked down, we strain out the cracklins (mmmmmm, cracklins) then pour the clear liquid into pint jars and process it in a water bath for ten minutes. I did some research, and apparently home-processed lard is actually better for you than Crisco, butter, and other processed fats because it doesn’t have the partially hydrogenated fats that commercially manufactured oils do. I’m really excited to try cooking with it for the first time! In outside news, I haven’t really started winterizing the garden beds yet, but I did open up the big garden for the chickens. Open access to the delicious garden plants is definitely the chickens’ favorite sign that fall is here. Since Shy utterly destroyed all our fruit trees (whoever wrote in the “Alpacas for Dummies” book that alpacas are just grass eaters obviously never owned one), I’ve taken to opening the pasture gate on nice days and letting all the critters have a prison break. 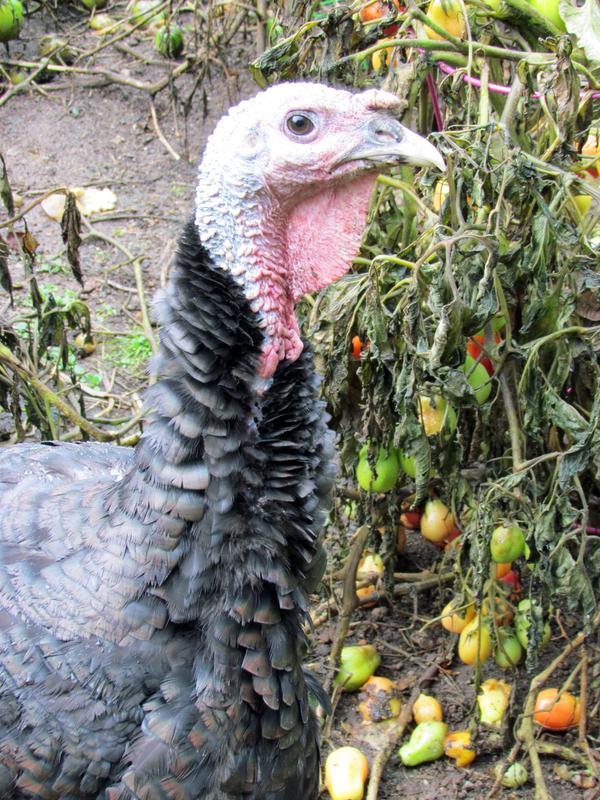 Dimsworth in particular has developed a taste for tomatoes, and he spends all day grubbing around the garden, happy as can be. With all the rain we’ve been having, the pasture has once again turned into a flood zone. 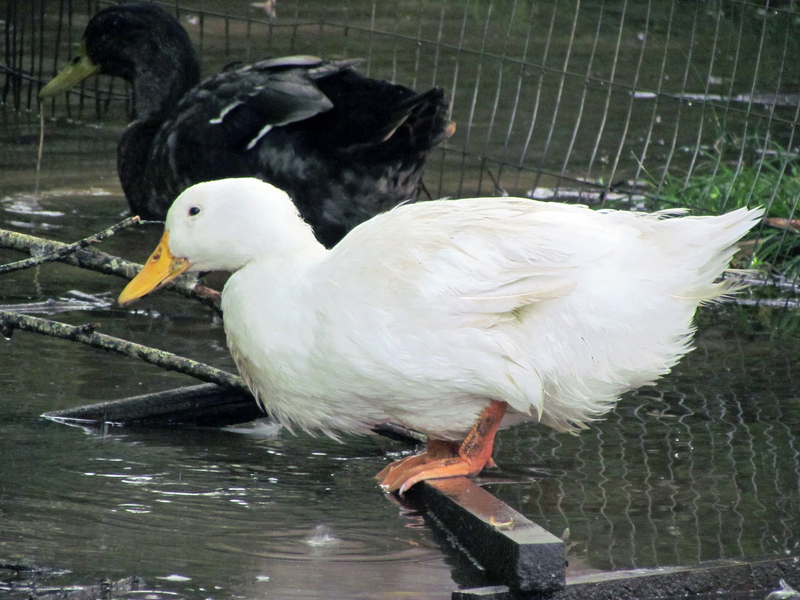 Although the ducks don’t mind, I got so sick of wading (literally wading) through boot-sucking mud that I asked Abigail to bring down her tractor and scrape all the muck up into one big pile. After building Mt. Dooky, we brought in 8 yards of sandy pit run and dumped that on top of the hard pan. Once that gets packed down a bit, I’m hoping it will solve the flooding issue. Gene and I also bought a huge bag of pasture grass seed, then waited until after dark when the chickens were sleeping and stealthily seeded the entire pasture. Then it rained for five days straight and washed it all away, so we’re going to have to buy another bag. 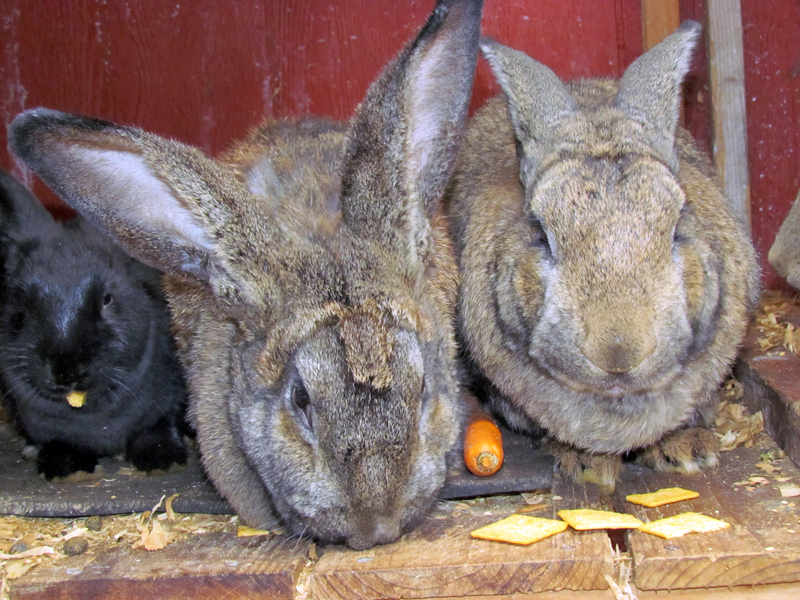 Because it’s so wet outside, I’ve had to keep the bunnies confined to their ranch. Even though Harvey’s not particularly happy about it, I make it up to them by bringing extra Wheat Thins and carrots out on regular basis. There’s only two baby bunnies left, and all four of them love hanging out together in Harvey’s bedroom. I will be the first to admit I get a little (okay, a lot) melancholy this time of the year, since I can’t spend as much time as I want to outside because of the rain. Then when I am outside, I’m surrounded by dripping water and dying, rotting garden crops. It’s by far my least favorite time of the year, but I distract myself by planning for next year’s gardens, and by looking hard to find beauty in all the dampness. As I was harvesting some tomatillos, I managed to find perhaps the cutest slug on the entire planet, and he was HUGE. 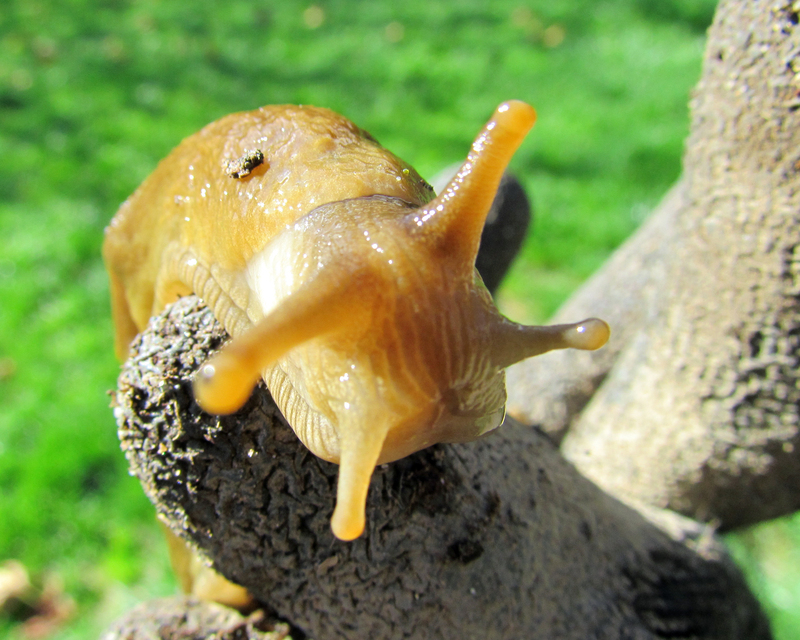 I know slugs are disastrous to crops, but since everything is dying back anyway, I figured I would let him live out his long and happy sluggy life. I even put him underneath the trellis containing all the nasty, not-at-all-as-delicious-as-everyone-on-the-internet-said Mexican Sour Gherkins. Maybe the slug will appreciate the fact that everyone but me is raving about them, and have himself a picnic.